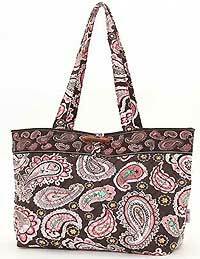 The Quilted Paisley Medium Tote Bag is made with quilted fabric is shades of chocolate brown with pink and green paisley. 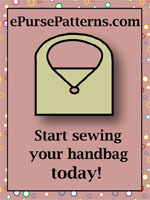 There are double handles and a loop closure with an oval button. 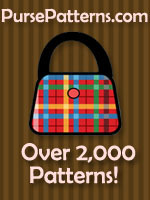 Inside is a fun gingham brown and white print with three open slip pockets with matching paisley fabric trim on the top. Measurements are 14"W x 11"H x 4"D with a handle drop of 12".